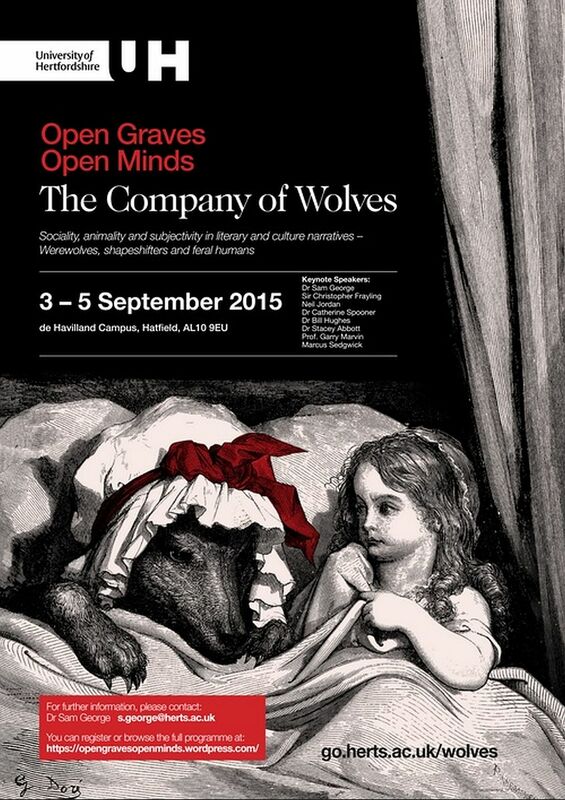 The Open Graves, Open Minds Project was initiated in 2010 with the Vampires and the Undead in Modern Culture conference and reconvened for the Bram Stoker Centenary Symposium in 2012. We turn our attention now to creatures not strictly undead but which haunt the peripheries of the vampire—werewolves and shapeshifters. Such beings have served in narrative fiction to question what humanity is; weres tend to reveal the complex affinities and differences between our existence as linguistic, social subjects and our physiological continuity with other animals. They also draw our attention to questions of hierarchy and sexuality, to the instinctive, and to what extent our conceptions of these are ideological. Werewolves, along with vampires, have recently become humanised, even romanticised, as identity politics became mainstream and the Other assimilated. The ancient paradigm of Beauty and the Beast lives on in paranormal romance. And just as the vampire figure both conditions the shape of the subgenres it dwells in and draws other genres into its sphere, so fictions about werewolves, wild humans, and human-animal relationships also invoke questions of genre and intertextuality. Thus, we are also interested in other narratives and discourses such as beast fables, taxonomies, human metamorphoses, and stories of feral children and those raised by animals which question the boundaries between animal and human. Amidst concerns about our relationship with nature, in a culture informed by Romanticism and a post-Enlightenment doubt about the centrality of humanity, contemporary fictions often turn to the animal, and to transitions between animal and human (particularly the werewolf and kindred figures) to interrogate what is special about our species. In her werewolf paranormal romance, Shiver, the YA author Maggie Stiefvater quotes Rilke: ‘even the most clever of animals see that we are not surely at home in our interpreted world’. This perhaps captures our amphibious nature and raises the kind of questions we are interested in. The conference will explore human social existence and its animal substrate, and the intersection between the human and the wolfishly bestial as expressed in narrative media from a variety of epochs and cultures. It will provide an interdisciplinary forum for the development of innovative and creative research and examine the cultural significance of these themes in all their various manifestations. As with the initial OGOM conference, from which emerged a book and a special issue journal, there will be the opportunity for delegates’ presentations to be published. The programme features a number of eminent keynote and plenary speakers: Professor Sir Christopher Frayling, educationalist, writer, broadcaster, commentator, Governor of the British Film Institute and former Chairman of the Arts Council, will be speaking on ‘Inside the Bloody Chamber: Angela Carter’s Wolves’. Prof. Garry Marvin will present on ‘Cultural Images of the Wolf and the Wolves’s Re-emergence in Europe’, Dr Catherine Spooner on ‘Wearing the Wolf’, Dr Stacey Abbott on ‘The Sound of the Cinematic Werewolf’, Dr Sam George on ‘Wolf Children’, and Dr Bill Hughes on ‘Werewolves and Paranormal Romance’. There will be contributions too from the field of fiction, including prize winning novelist Marcus Sedgwick. There are over fifty papers from international scholars including OGOM PhD students, Kaja Franck and Matt Beresford, who will present papers on their current research involving werewolves. Delegates will have the opportunity to visit unique places associated with our theme, and to actually ‘walk with wolves’. There will be werewolf theatricals and games and David Annwyn Jones will stage a lycanthropic lantern-of-fear show projected from an antique magic lantern. Be very afraid! For more information, contact Dr Sam George at s.george@herts.ac.uk.